There many handsets that are listed on the Intex official website but are not launched yet. Now a new handset the Cloud Y4 arrives in the same way. The device comes at very affordable price and looks quite stylish. The Intex Cloud X5 and Aqua N2 are listed about a week before which would compete with this handset. The Y4 has 4inch WVGA capacitive touch screen display and 1GHz dual core processor paired with 512MB of RAM. It packs with 5MP snapper at the back with LED flash and a 1.3MP front shooter. It runs on Android 4.2.2 Jellybean operating system and has Dual SIM capabilities. The phone houses 1400mAh battery that offers 6 hrs of talk time and up to 250 hrs of standby. 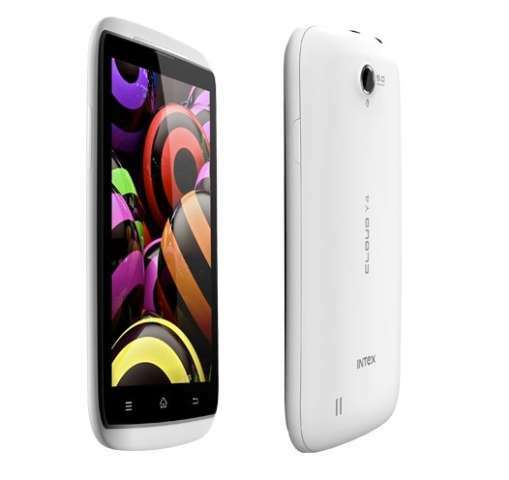 The price of Intex Cloud Y4 is Rs 6,900 and comes in white and black color. There are many handsets in the market with dual core CPU and similar features. So overall there is nothing that makes it different other than its Price and look.